I've been keeping my eyes open but where are the winter finches? Where are the purple finches and the common redpolls? Where are the pine siskins and the crossbills? I demand satisfaction! Winter finches (not actually all finches) tend to be irruptive. Last winter was great with many redpolls, siskins and crossbills in the Twin Cities due to a good crop of seeds. A neighbor of my parents almost had a twenty foot tall spruce tree tip over it was so heavily laden with seeds. I'm guessing this winter will be pretty quiet but hope I am wrong. 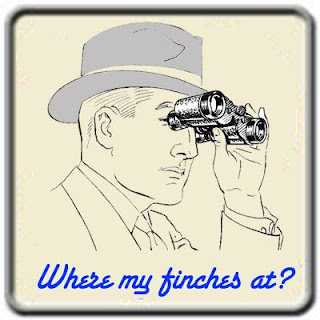 So, where my finches at? In addition to Goldfinches, which stay here year-round, we usually get a few Purple Finches late in the winter (February/March), but that's about it. We got in on the Pine Siskin irruption last year, but I don't hope to see those guys anytime soon b/c they were big bullies to our Goldfinches! I saw some purple finches earlier in December but only a few and they didn't stick around. Interesting about bullying. We never had that but then again we only had a couple of siskins and never the huge mobs some people had. Found your blog this past weekend. Was up north at the cabin, asking myself the very same question. Check my journal and wondered where the redpolls and siskins were. Thanks for the info. Sure do miss seeing those little guys. FYI. Had a tragedy last year with a thistle sock feeder. A redpoll got it's foot caught in the fabric and froze to death. NO MORE SOCK FEEDERS IN WINTER! Yikes, thanks for the comment. I hadn't heard of that problem with sock feeders but I've never used them.